Best Buy surpassed its own Q2 forecast, as well as analysts' sales and earnings expectations. Nevertheless, Best Buy stock fell 5% on Tuesday, as investors continue to doubt the sustainability of its growth. On Tuesday, Best Buy (NYSE:BBY) revealed that sales and earnings surpassed its guidance -- and analysts' expectations -- for the second quarter of its 2019 fiscal year. The company also raised its full-year outlook. This is just the latest of many earnings beats in recent memory for the consumer electronics giant. However, investors have treated Best Buy's recent earnings reports as opportunities to sell Best Buy stock. That pattern continued following the company's Q2 earnings release. 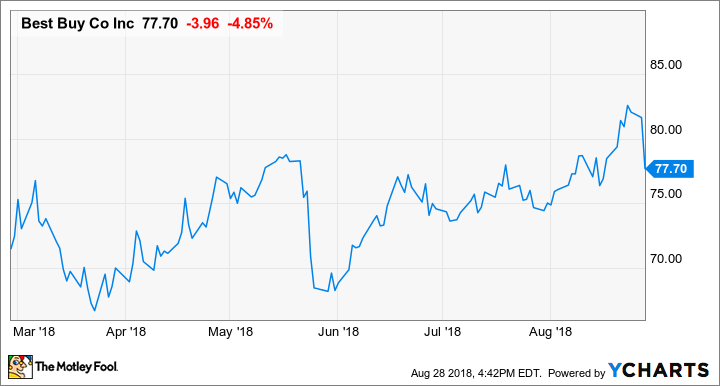 Three months ago, Best Buy reported blowout sales and earnings growth for the first quarter but projected that growth would slow in the second quarter. The Q2 forecast called for 3% to 4% domestic comp sales growth and 1% to 4% international comp sales growth. Adjusted earnings per share was projected to reach a range of $0.77 to $0.82, up from $0.69 a year earlier. At the time, I suggested that this likely reflected management's customary conservatism. Indeed, it was no surprise that Best Buy easily surpassed these targets for the second quarter. In the domestic market, comp sales rose 6% year over year. Outside the U.S., comp sales surged 7.6%. That translated to a consolidated comp sales gain of 6.2%. Adjusted EPS reached $0.91, 11% above the high end of Best Buy's guidance range. Best Buy's second-quarter results also beat analysts' expectations. The company's revenue of $9.38 billion was about 1% above the analyst consensus of $9.28 billion. Meanwhile, analysts had expected adjusted EPS of just $0.83. In spite of this solid sales and earnings beat, Best Buy stock plunged as much as 8% on Tuesday, before recovering somewhat to close with a 5% loss. In the U.S., Best Buy posted solid comp sales growth across all merchandise categories. That said, appliances remain its fastest-growing category, with a 10.3% comp sales increase in the domestic market last quarter. Rising spending on home renovations is partially responsible for this surge in appliance sales. But just as importantly, the rapid downsizing of Sears Holdings (NASDAQOTH:SHLDQ) has put a massive amount of market share up for grabs. (Sears' shrinking presence may also be having a smaller impact on Best Buy's other merchandise categories.) The demise of consumer electronics and appliance retailer hhgregg, which closed its last stores in May 2017, also likely contributed to Best Buy's comp sales growth in the second quarter. Appliances have been an even bigger standout outside the U.S. Best Buy posted a 35.7% comp sales gain for appliances in its international segment last quarter -- the category's seventh consecutive comp sales increase of at least 30%. Here, Best Buy is cashing in on the liquidation of Sears Canada, which was completed at the beginning of this year. For the third quarter, Best Buy expects to post 2.5% to 3.5% comp sales growth in the U.S. and 2% to 4% comp sales growth in international markets. Adjusted EPS is projected to reach $0.79 to $0.84, up very modestly from $0.78 a year ago, despite the benefit of tax reform, due to the timing of some costs and a tough year-over-year comparison. Best Buy also raised its full-year guidance on Tuesday to reflect its strong first-half performance. It now expects comp sales growth between 3.5% and 4.5% (up from its original projection of 0% to 2% growth) and full-year EPS of $4.95 to $5.10 (up from an initial forecast of $4.80 to $5). Still, incorporating Best Buy's year-to-date performance and its Q3 guidance, the full-year sales guidance implies flattish comp sales for the fourth quarter. Once again, it seems quite likely that management is being extremely conservative with its quarterly and annual forecasts. After Best Buy's stock slump on Tuesday, the shares trade for 15 times to 16 times projected earnings. That's a very reasonable multiple, considering that Best Buy has more cash than debt and has been investing heavily in growth areas centered around services like tech support. The likely demise of Sears Holdings in the next few years will provide further growth opportunities. In short, Best Buy stock may not be as cheap as it once was. However, it's still reasonably priced in light of its strong trajectory and future growth potential.